Our binge TV weekends include catching up on missing seasons of Mad Men, Damages,The Closer, and Nip Tuck. There is something wonderful about watching an entire season at once. The concentration and devotion feels productive and satisfying. I would recommend this to anyone on a bitter cold weekend. In fact, you are going to have a good opportunity to try it out. Netflix, Hulu, and Amazon are planning to release entire seasons of new TV shows all at once. This is a whole new concept for streaming video even though “marathon” viewing has been popular ever since the introduction of box sets of tv shows. Netflix just released a new drama designed to be viewed in one sitting. 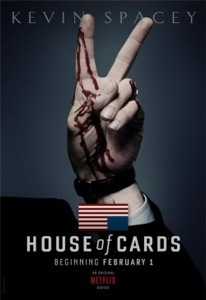 “House of Cards” is a political thriller starring Kevin Spacey and Robin Wright. Netflix will make their 13 episodes available to stream at the same time. The producers of this new series said there will be “cliffhangers” but not in the same way as we know them today. There is also a strong possibility that the use of episodes might go away and be replaced with 10 straight hours of TV. We are entering a world where viewers will want to have the same controls on their televisions as they have on their computers. TV producers and the creators of programming realize that many more people do not want to adhere to a schedule anymore. They want the freedom to DVR and stream at will. The times they are a-changin’. This entry was posted in digital, senior lifestyle, tech and tagged Amazon, Hulu, Netflix by loiswhitman. Bookmark the permalink. My sister saw the first one and said it was formulaic, offset by the fabulous Kevin Spacey and the cheeky use of breaking the Fourth Wall by him. His asides are the real gems. I will watch this, although I’ll probably binge in my jammies as you suggested. Meanwhile, Netflix is gathering “Big Data” on every pause, rewind, and bail to craft craftier shows that exploit their learnings. Makes me a little self-conscious. I always pause to examine written items onscreen and to bust the directors on hand close-ups. They often use the hand of a grip instead of the too-important star, and they have rough cuticles.